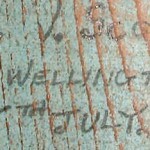 In addition to their signatures on the shed wall, Cpl Scott is mentioned in the Unit War Diary of his regiment (as far as I am aware, this appears to be quite unusual as it is usually only higher-ranked soldiers that are mentioned by name). 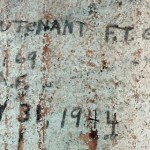 Pte Blunt’s daughter found my contact details through an earlier “version” of this website and kindly shared photographs and copies of his military records. 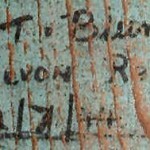 Initially, I had been seraching without success for a “1st Lt Gilles” (if you take a close look at his signature, you may see why – the “pie” was almost lost. However, with assistance from one of the archivists at the American Archives department, it soon transpired that “Gillespie” was the name that I was after. This, in turn, generated a “hit” on John Levesley’s website dedicated to the American 404th Gighter Group (www.winkton.net) and, after a little while, the fantastic opportunity to speak to Francis Gillespie. 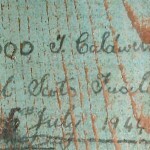 Having obtained copies of the PoW Questionnaires, I decided to Google name & address combinations. Only one success, so far & that resulted in a meeting with Marjorie Caldwell, the daughter-in-law of Cpl Tom Caldwell & a sharing of information.